Have been busy – so stoked to share this news. I just put this together, so spread the word and come down and come and get wild with us if you’re in the hood. We’re kicking off summer with a Halloween style yoga experience that will have you spooked with pleasure. After a big start to 2014 performing festivals such as Splore and Wanderlust, YogaRhythms is pleased to announce a transformation from a dynamic duo to cultural collective utilizing prolific teachers, musicians and performing artists to join DJ R.I.A at the musical helm. 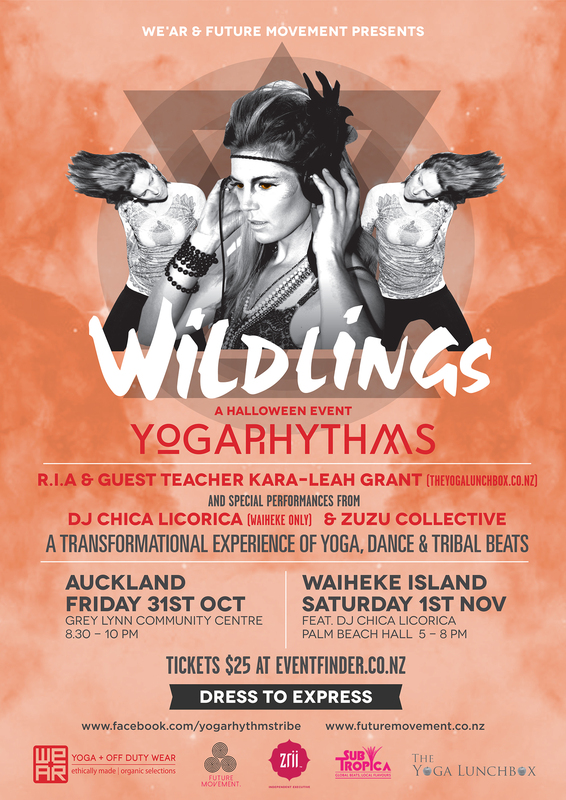 YogaRhythms is thrilled to be working with respected teacher, writer, and speaker, Kara-Leah Grant from theyogalunchbox.co.nz, who will guide the experience through two events of mind, body and soul stimulation. Not only is she an inspiring teacher, she has also trained with world-renowned global yoga goddess Shiva Rea in the art of Trance Dance. She is also one of the local talents teaching and speaking at next years Wanderlust Festival at Great Lake Taupo. YogaRhythms is an all encompassing, interactive, fun fusion of yoga with world-driven beats, for a guided journey through connectedness, radical self-expression, movement and unity. Yoga and dance are one and the same – breath-led movement designed to free our souls. YogaRhythms will also be playing Splore & Sundaize Festival this Summer. A couple of ‘Must haves’ for the playlist..